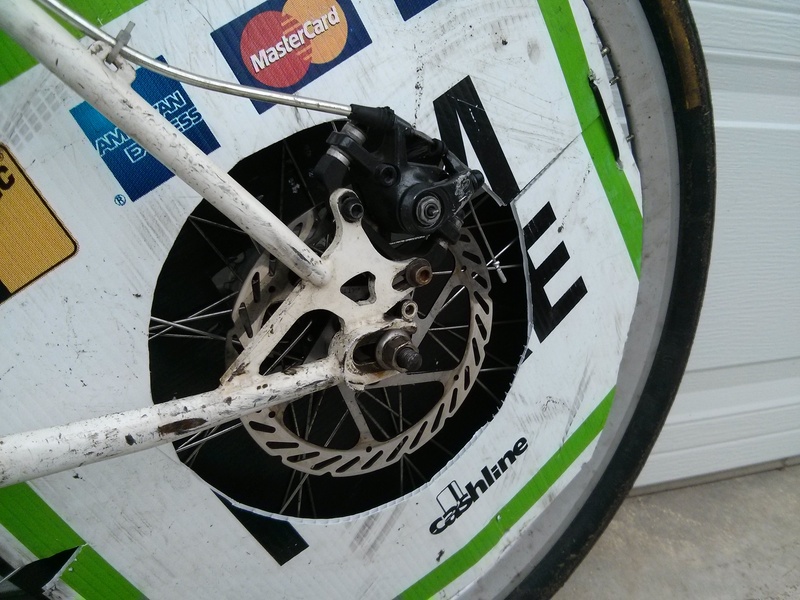 Posted on 19 February, 2014 19 February, 2014 2 Comments on What if we just give the bikes away? … as young men often ask me, as they struggle to maintain interest while I spin off on a bike related tangent. Well, I’ll tell you. A polo bike is a rough looking, scratched up, bomb proof, 90’s style rigid mountain bike with a few modifications that make it easier to beat around on a basketball court while trying to smack an orange hockey ball with a mallet made out of ABS pipe and a ski pole. Jackie Kanyuck recently let me have her old one, and it is seriously the bomb. Just gonna take a sec to brag here, but I used to score maybe once in three games if I was lucky. These days I’m scoring usually once or twice in every game, and doing a much better job of preventing Ryan, Ryan and Greg from scoring on me. And I’ll show it to you. We’ll go through this bit by bit. The frame is a Surly 1×1, a modern design, but a throwback to the old 90’s mountain bikes, you know the ones with the absurdly long stems and the gently curved forks, as ridden by nerds like this. First, notice the fork and headtube. See how straight that line is? So straight. That’s so you can turn in tiny, tiny circles at very low speeds. Kona forks in particular are well known for being relatively common as salvage (i.e., cheap), but also tough and decent quality. And straight as straight can be. Queer people are welcome, but queer forks are not. We call that “zero offset fork” and “no rake”. 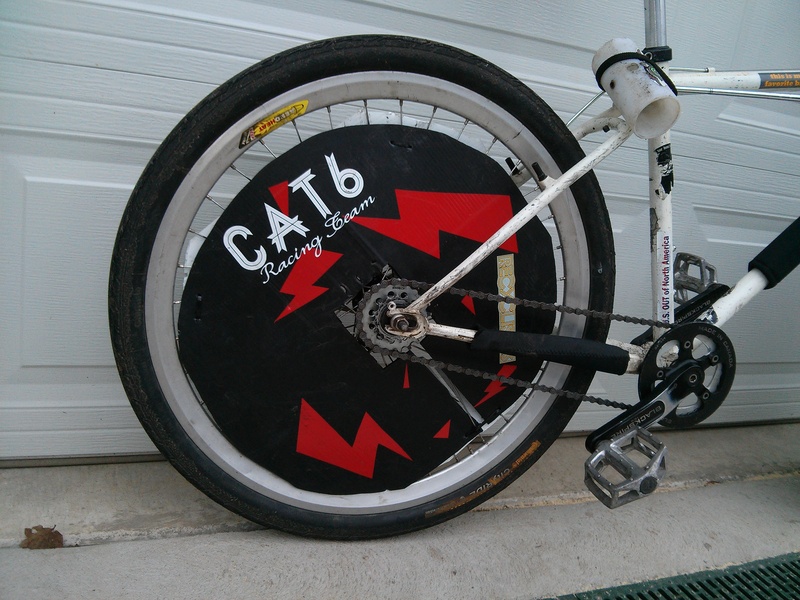 The wheel covers are to prevent balls and mallets from getting stuck in your spokes, and preventing damage to the spokes. Balls make a very satisfying *smack* as they bounce off the corrugated plastic. I am always surprised when I see people playing without them – they’re essential, in my opinion. Brakes are the most important polo mod. 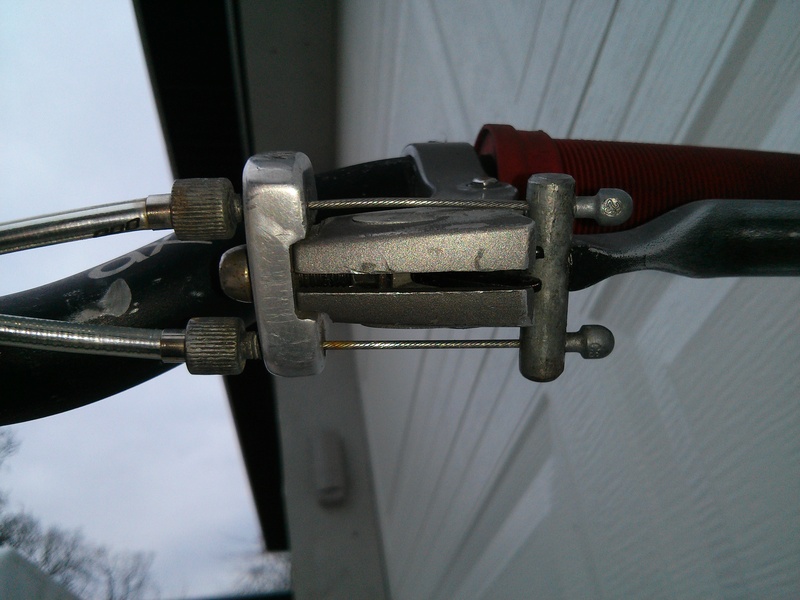 You have to brake with your non-dominant hand so you can swing with the other. 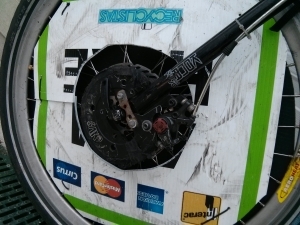 These days all the big deals in polo seem to be using either dual brakes or just a front brake. 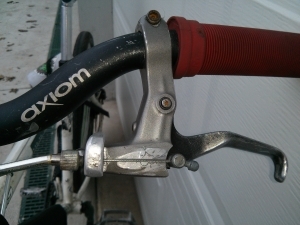 In the past I just had a single rear, rim brake, with the lever moved to the left side of the bars. Back brakes give you less stopping power, but you’re also less likely to flip yourself over, as our man Greg does frequently. 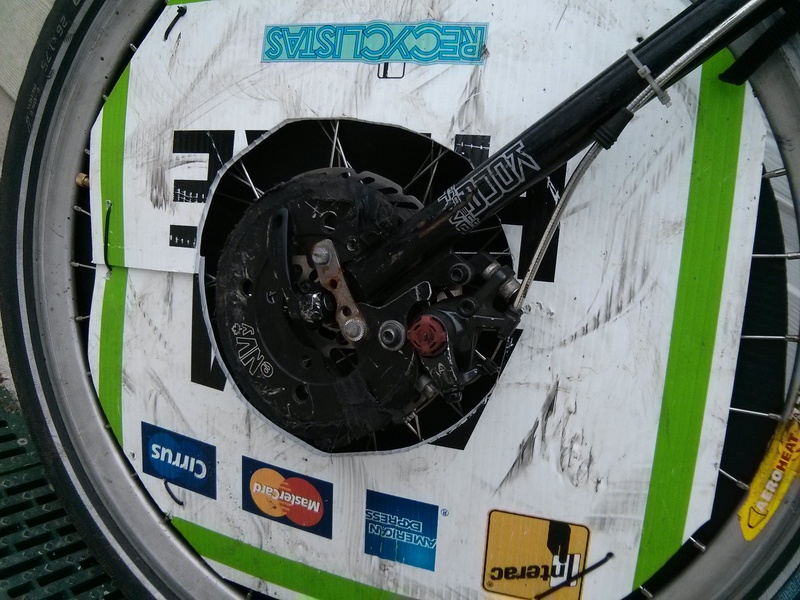 But, Jackie had some awesome BB7 disc brakes on the Surly, and who am I to argue? They are amazing. It’s my first experience with disc brakes and I can confirm that they stop me on a dime regardless of how wet they get. Jackie also hacked up this dual brake lever, for double the stopping power. It helps with the flipping-over problem. 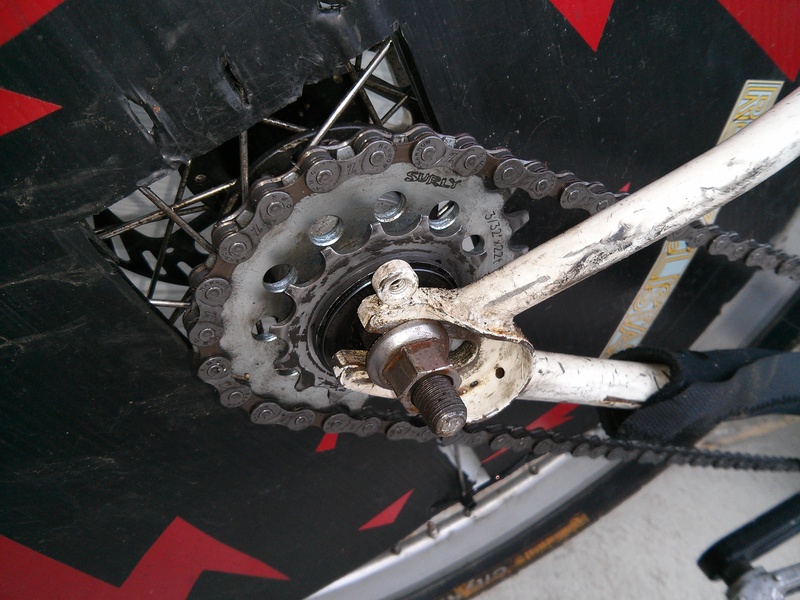 For the drive train, we want a nice loooow gear ratio, for quick accelerating. 32-22 is perfect, anyone who says otherwise is lying and wrong. 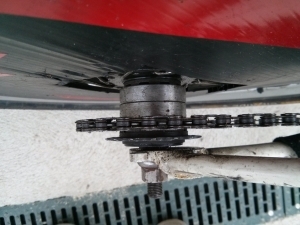 In the past I used a cassette cog from some Shimano 10 speed sprocket, which worked okay, except for how it skipped all the time. This bike came with roughly the same deal. 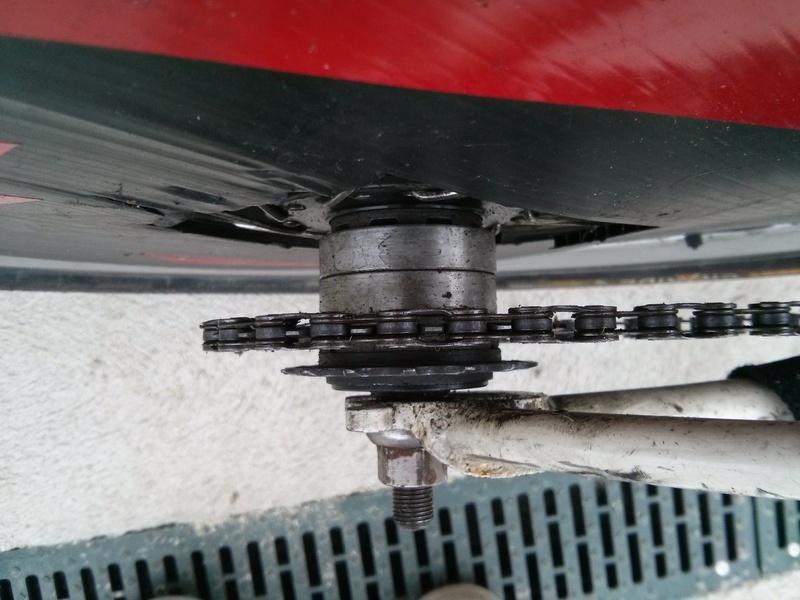 First thing I did upon receiving it was replace the entire drive train. The chain and front chain ring were direct replacements, but I put this beautiful Surly single-speed cog on instead of the cassette mess. As long as I replace the chain often enough, it should never skip again. Not much to say about the seat; it’s cheap and comfy. The seatpost is more interesting. It’s like, the longest seatpost ever. With my old bike I needed the whole thing. This frame is a bit more reasonably sized. Fully half the seatpost is inside the frame. More stability? Sure. Stickers are important, obv, they add 5hp each. 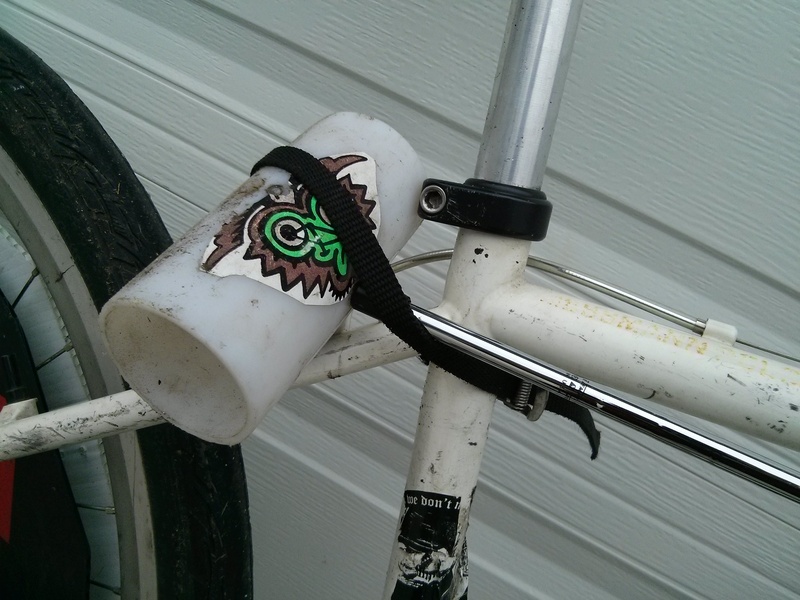 Pedal straps are perfect for attaching your mallet to the bike. Ultimately, the player is more important than the bike. 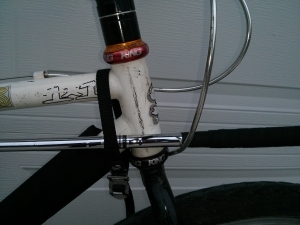 But hey, I’m a bike nerd, I love this stuff. I could write an essay on each individual part. In fact I might do so. I also rode a cheap, old, flexy, badly-handling polo bike for quite a long time, and I got good on it. Now that I’m a good enough player to justify the decent bike, it makes a huge difference, and I feel that I’ve earned it. And I feel like a rockstar when I’m riding it, and that’s the most you can ask of any vehicle. Posted on 9 February, 2014 10 February, 2014 Tags bb7 brakes, bike polo, cat 6 racing team, fly as high as you dare, hardcourt, mountain bike, mtb, NAH, odi grips, polo, polo gear ratio, polo mallet, surly, the beavers, the guardians2 Comments on What exactly is a polo bike, anyway?